No. 1 Duke wins at Tobacco Road rival Wake Forest. WINSTON-SALEM, N.C. (WTVD) -- Nobody in college basketball attacks the rim quite like freshman sensation Zion Williamson does. His Duke teammates started doing it in the second half, and suddenly the top-ranked Blue Devils had yet another blowout victory. 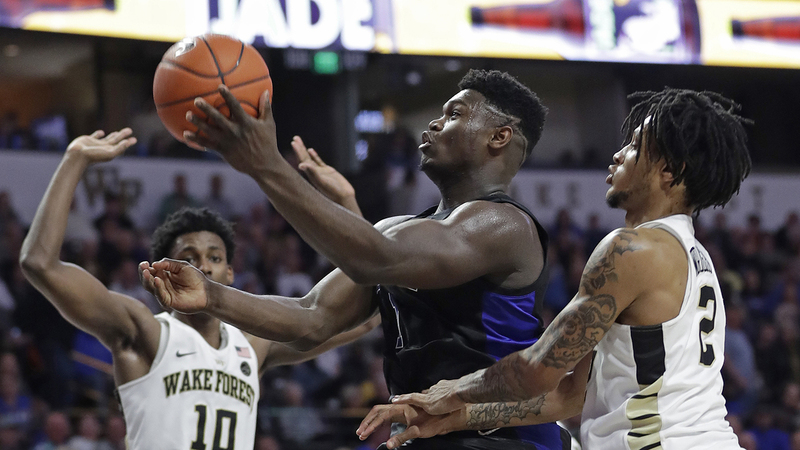 Duke's Zion Williamson, center, drives between Wake Forest's Jaylen Hoard, left, and Sharone Wright Jr. during the second half in Winston-Salem Tuesday. "Coach is always telling me to shoot the ball, and at first I was like, if it's not falling, I'm really not going to shoot it," Williamson said. "Even when I miss, they say, 'Keep shooting. You can make it.' ... Even after I shot one over the rim, they were like, 'Z, shoot another one,' and I got it right back and made it. I think my confidence shooting 3s is getting a lot better." "Any time we rebounded defensively, we had a fast break," Duke coach Mike Krzyzewski said. "So there was going to be stuff in the lane, and when we didn't (rebound on defense), they got second shots. When we get our transition going, we're better. We're just better. That's an integral part of our game." "Disappointed to lose. That's always the mindset, but you've got to dig yourself out of it," Manning said. "It's the best league in college basketball. This is the league we signed up for." "'You're a bad guy because you haven't done it,' or 'We're not as good because we haven't done that yet.' Ludicrous, really. . When I see stuff like that, come on. It cheapens that person's . knowledge of the game. Come on, man. We come up with a top-10 schedule every year." - Krzyzewski, when asked about not playing a true road game until now.